As spring has settled in and the warmer air is staying with us, I have been turning my creative attention towards that gift of April and May: flowers. Every year when they start poking their heads out of the ground, a sense of excitement and relief washes over me. I’m sure most people feel the same after the long winter! Unfortunately, I must confess here – I do not have a green thumb. It’s about as far away from green as a thumb can get. I can keep a cat, a fish, children and a husband alive, but sadly not a plant. I’ve always thought it odd that I’m so horticulturally challenged because I come from a long line of gardeners. My grandmother was President of the Leominster Garden Club (and even President of the Past Presidents Club) – what would she think of my brown and empty lawn! 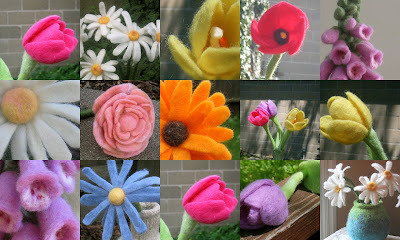 That’s perhaps why I find it so satisfying to make these felted flowers. I could make nothing but these all year and be completely happy. Of course, spring doesn't last long here in New England - but these flowers do! I haven’t given up all hope for myself in the area of gardening, however. I’m planning to get out this weekend and do some weeding! So gorgeous. Such a pleasure to see. Keep it up Lynne! I have a hunch that a gardener is lurking within you. You just need more time which will come eventually.